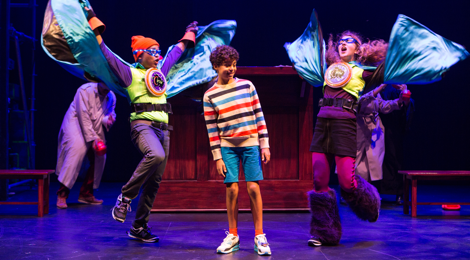 The musical Jacob Two-Two Meets the Hooded Fang returns to Young People’s Theatre to celebrate the 40th anniversary of the book’s publication. YPT first brought the story to the stage in 1979 in an adaptation by Joy Alexander, Peg McKelvey, Pat Patterson and Dodi Robb with music by Stephen Katz. For its present incarnation, YPT has commissioned new music and lyrics by the sister team of Britta and Anika Johnson. Never having seen the previous version, I’m not able to compare the new version with the old. Yet, on its own the new version is lively and imaginative and clearly held the audience of kids from 8 to 14 rapt in attention. For those who don’t know it, Mordecai Richler’s book focusses on six-year-old Jacob (David Gregory Black), the youngest of five children, who is called Two-Two because he has to say everything twice since no one pays any attention to him the first time. Everyone in his family tells him he’s too little to do anything – his father (Matthew G. Brown), his mother (Kira Guloien), his two bothers (Jeigh Madjus and Robert Markus) and his two sisters (Sarah Gibbons and Sabryn Rock). Jacob’s father finally lets him run an errand to buy two pounds of tomatoes at the corner store, but there the storeowner Mr. Cooper (Damien Atkins) assumes that Jacob’s habit for repeating everything is an insult and calls in the police. Feeling defeated Jacob lies down and has a dream in which he is put on trial for insubordination to an adult. He’s given a lawyer with the fateful name of Louis Loser (Darrin Baker), who as one might expect, loses his case, leading to Jacob being sentenced by Judge Rough (Saccha Dennis) to children’s prison. Before he is sent off, however, he is contacted by two representatives of Child Power – Shapiro (Sarah Gibbons) and O’Toole (Jeigh Madjus). They want Jacob to find out why no one can find the island where the prison is located and to help liberate the imprisoned children. Jacob sails off to the Children’s Prison with his guards Master Fish and Mistress Fowl, who not accidentally are played by the same actors who played his parents. There he meets the dreaded warden of the prison, the Hooded Fang (Damien Atkins), a former WWF wresting champion who quit after a child laughed at him. Jacob learns how the island is kept invisible and figures out the Hooded Fang’s weak spot to save the day. This seems like a lot of plot to cram into only 70 minutes, but the adaptation is done so well with the songs helping move the story forward that the show never feels rushed. The Johnson sisters may only be in their twenties, but they clearly have a knowledge of popular music of other eras. Jacob Two-Two is particularly imbued with sounds of the 1970s, from heavy metal to disco to middle-of-the-road, which perfectly suit a story from 1975. The storyteller at the prison is the Elvis-like Artie Octopus (Jacob MacInnis), who sings a hilarious anti-goodnight story to the children in late-Elvis style. The Johnson sisters have a liking for occasional lines with lots of rapidly sung words. Though everyone in the cast is a fine singer, all could stand more practice in enunciating these lines which too often were incomprehensible. Two boys alternate in the role of Jacob – David Gregory Black and Drew Davis. I happened to see Black, who acted and sang the role with power and assurance. Damien Atkins is very funny both as the fussy grocer Mr. Cooper and as the Hooded Fang, who secretly worries that no one fears him. Matthew G. Brown and Kira Guloien, who are well-meaning but distracted as Jacob’s parents, become positively mean as Fish and Fowl, far more frightening, despite their animal habits, than the Hooded Fang. 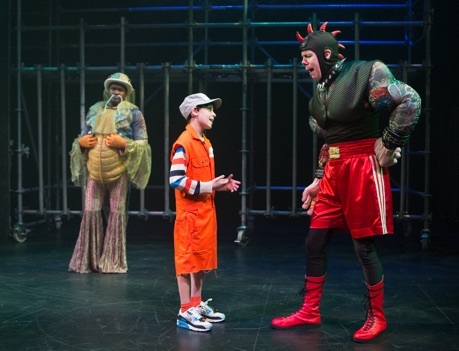 In other roles, Jason MacInnis shines as the singing octopus, Darrin Baker cuts an appropriately sorry figure as Louis Loser and Saccha Dennis’s Judge Rough embodies all that children might think unfair about adults’ decrees about what they can and cannot do. Jeigh Madjus and Sarah Gibbons impressed the audience as the forces of Child Power, but they appear to be such superheroes one wonders how adults manage to have any power at all. Dana Osborne’s set which looks like two high piles of boxes may suit the grocery store scene but seems out of place for the scenes with Jacob’s family. Once they are turned around and become the fog-making machine that shrouds the Children’s Prison their design makes sense. William Schmuck has devised imaginative costumes especially for the creatures in Jacob’s dream – the Hooded Fang, Fish and Fowl, Artie Octopus and Mr. Fox. Having the Hooded Fang not actually played by an over-muscular adult, as pictures from the old production show, is a definite improvement, because it allows us to see, rather than just imagine, what the Hooded Fang is really like inside. Though you may not be able to hum a tune from the show afterwards, the Johnson sisters music had the audience bouncing in their seats along to the beat. The show is about child empowerment and the importance of hearing children’s voices. Curiously, it was the second of their themes that really hit home. In the Q&A following the show, a surprising large number were not against the idea of adults making decisions for children. In fact, many children thought the role of adults was to protect children. It could be that Richler’s story, brought so forcefully and colourfully to the stage in this production, may inspire a wider range of discussions that he imagined. Photos: (from top) Jeigh Madjus as O’Toole, Drew Davis as Jacob and Sarah Gibbons as Shapiro; Matthew G. Brown as Master Fish, David G. Black as Jacob and Damien Atkins as the Hooded Fang. ©2015 Cylla von Tiedemann.